Presentations have a great impact value to showcase anything in front of someone. Presentations affect your way of presenting yourself, whether it is something related to business or not. Now-a-days presentations are made on the computer using the application software. There are several presentation software available in market as MS Power Point, Prezi etc but most of the software do not offer such functionality as is needed to create great presentations in a short time. 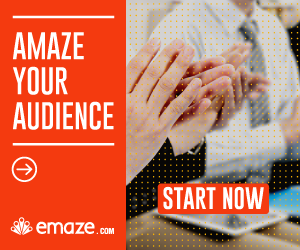 Emaze is a step towards changing the way we look at presentations and presentation making. Emaze is the future of presentations. A tool which lets you make amazing and impressive presentations regardless of your expertise in using computer and your artistic and aesthetic abilities. Everything is preset in to the software. You just have to enter the information and it will take care of the rest including the lay-out, formatting and design. A large number of templates are present and you just have to select one and start inputting the information. It will take you just some minutes to make an amazing presentation. The Microsoft PowerPoint has been a part of the Microsoft office utility for a long duration of 20 years. It is the software used by Windows powered devices to make presentations. It is the power behind 93% of the presentations created globally. But, now people are tired of PowerPoint and new software in the field will be highly appreciated. This is mainly because people want to make presentations easily and want them to be more effective and impressive. cost Costs $9 per month for the top version. Costs above $12 for the top version. Free? Free version provides basic functionality. Free version has very limited functionality. Infrastructure It works on HTML 5 infrastructure. It works on the Windows operating system. Ease of Use Easiest to use presentation for all. Needs a certain level of understanding to use. Templates Preset templates are available making work easy. You have to design the presentation; the preset templates are very basic. Storage It uses Cloud Based Storage by default. Data can be accessed from anywhere. It uses the Computer’s storage so the data must be carried in a portable device (cloud storage can cost extra charges). Translation Automatic translator and spell check are available. Translator not available. The PowerPoint has been used for more than 20 years to make presentations but now people are looking for a better tool. No one has long durations of time to spend on making the presentations. Also, everyone does not have the expertise required to operate the complex features of PowerPoint. Emaze is designed to be used by an utter newbie and is hence entirely easy to use. It means that Emaze has a bright chance of getting user appreciation. Added to it is the fact that it is free and is cloud based. This also gives the user a reason to prefer it over the PowerPoint. According to Emaze’s CEO, there is a potential of as much as 500 million users using their online software in the coming years. Emaze team is working for the best they can provide so that the customer can take care of the content of presentation and the rest is up to the team. They are working to enhance the templates, slide transition methods, Visual effects and much more which will give a new ultimate presentation experience to the customers far beyond their expectations. Microsoft PowerPoint surely outruns the Emaze in having a well-formed parentage and a longer history but it does not mean that Emaze is nothing. Emaze offers greater functionality and flexibility to the users. The software is cloud-based which means that the data you create using it will never be lost and you will not have to carry the data with you (PowerPoint also offers that function but that may result in extra charges). You can connect any device to the World Wide Web and access the data at any time from any place in the world. PowerPoint is historical, well-formed and the oldest software of the field whereas, Emaze is futuristic, modernized and more flexible. It offers more functionality and is easier to use. So Emaze is the best option for people who are searching for online software to make presentation fast and easy. There is a potential of growth for this software because more than half billion users are using different software to prepare presentations on a daily basis. If you are not familiar with Emaze, check out our detailed review on Emaze and start making amazing presentations.